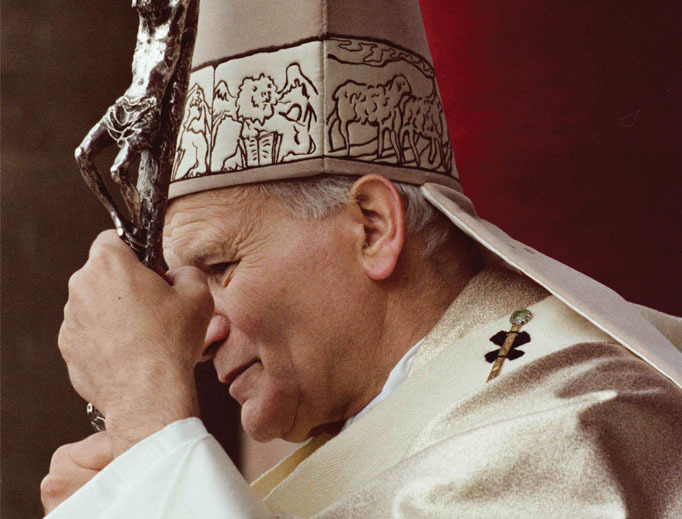 (In light of today’s feast of the Martyrs of Japan, what follows is a brief excerpt from Pope Saint John Paul II’s masterpiece – and too often neglected – encyclical Veritatis Splendor, the Splendour of Truth, on the principles of the moral life. Here the Holy Father meditates upon, and exalts, martyrdom for the sake of truth. We must all be willing to sacrifice for the truth, especially moral truths, even to the point of shedding our blood, something that may soon – given the direction of things – become all too much a reality. What we get in return is an eternal reward beyond description. As the martyrs exhorted each other, the pain lasts but a moment, but heaven, forever…). The relationship between faith and morality shines forth with all its brilliance in the unconditional respect due to the insistent demands of the personal dignity of every man, demands protected by those moral norms which prohibit without exception actions which are intrinsically evil. The universality and the immutability of the moral norm make manifest and at the same time serve to protect the personal dignity and inviolability of man, on whose face is reflected the splendour of God (cf. Gen 9:5-6). The unacceptability of “teleological”, “consequentialist” and “proportionalist” ethical theories, which deny the existence of negative moral norms regarding specific kinds of behaviour, norms which are valid without exception, is confirmed in a particularly eloquent way by Christian martyrdom, which has always accompanied and continues to accompany the life of the Church even today. In the Old Testament we already find admirable witnesses of fidelity to the holy law of God even to the point of a voluntary acceptance of death. A prime example is the story of Susanna: in reply to the two unjust judges who threatened to have her condemned to death if she refused to yield to their sinful passion, she says: “I am hemmed in on every side. For if I do this thing, it is death for me; and if I do not, I shall not escape your hands. I choose not to do it and to fall into your hands, rather than to sin in the sight of the Lord!” (Dan 13:22-23). Susanna, preferring to “fall innocent” into the hands of the judges, bears witness not only to her faith and trust in God but also to her obedience to the truth and to the absoluteness of the moral order. By her readiness to die a martyr, she proclaims that it is not right to do what God’s law qualifies as evil in order to draw some good from it. Susanna chose for herself the “better part”: hers was a perfectly clear witness, without any compromise, to the truth about the good and to the God of Israel. By her acts, she revealed the holiness of God. At the dawn of the New Testament, John the Baptist, unable to refrain from speaking of the law of the Lord and rejecting any compromise with evil, “gave his life in witness to truth and justice”, and thus also became the forerunner of the Messiah in the way he died (cf. Mk 6:17-29). “The one who came to bear witness to the light and who deserved to be called by that same light, which is Christ, a burning and shining lamp, was cast into the darkness of prison… The one to whom it was granted to baptize the Redeemer of the world was thus baptized in his own blood”. In the New Testament we find many examples of followers of Christ, beginning with the deacon Stephen (cf. Acts 6:8-7:60) and the Apostle James (cf. Acts 12:1-2), who died as martyrs in order to profess their faith and their love for Christ, unwilling to deny him. In this they followed the Lord Jesus who “made the good confession” (1 Tim 6:13) before Caiaphas and Pilate, confirming the truth of his message at the cost of his life. Countless other martyrs accepted persecution and death rather than perform the idolatrous act of burning incense before the statue of the Emperor (cf. Rev 13:7-10). They even refused to feign such worship, thereby giving an example of the duty to refrain from performing even a single concrete act contrary to God’s love and the witness of faith. Like Christ himself, they obediently trusted and handed over their lives to the Father, the one who could free them from death (cf. Heb 5:7). The Church proposes the example of numerous Saints who bore witness to and defended moral truth even to the point of enduring martyrdom, or who preferred death to a single mortal sin. In raising them to the honour of the altars, the Church has canonized their witness and declared the truth of their judgment, according to which the love of God entails the obligation to respect his commandments, even in the most dire of circumstances, and the refusal to betray those commandments, even for the sake of saving one’s own life. Martyrdom, accepted as an affirmation of the inviolability of the moral order, bears splendid witness both to the holiness of God’s law and to the inviolability of the personal dignity of man, created in God’s image and likeness. This dignity may never be disparaged or called into question, even with good intentions, whatever the difficulties involved. Jesus warns us most sternly: “What does it profit a man, to gain the whole world and forfeit his life?” (Mk 8:36). Although martyrdom represents the high point of the witness to moral truth, and one to which relatively few people are called, there is nonetheless a consistent witness which all Christians must daily be ready to make, even at the cost of suffering and grave sacrifice. Indeed, faced with the many difficulties which fidelity to the moral order can demand, even in the most ordinary circumstances, the Christian is called, with the grace of God invoked in prayer, to a sometimes heroic commitment. In this he or she is sustained by the virtue of fortitude, whereby–as Gregory the Great teaches–one can actually “love the difficulties of this world for the sake of eternal rewards”. In this witness to the absoluteness of the moral good Christians are not alone: they are supported by the moral sense present in peoples and by the great religious and sapiential traditions of East and West, from which the interior and mysterious workings of God’s Spirit are not absent. The words of the Latin poet Juvenal apply to all: “Consider it the greatest of crimes to prefer survival to honour and, out of love of physical life, to lose the very reason for living”. The voice of conscience has always clearly recalled that there are truths and moral values for which one must be prepared to give up one’s life. In an individual’s words and above all in the sacrifice of his life for a moral value, the Church sees a single testimony to that truth which, already present in creation, shines forth in its fullness on the face of Christ. As Saint Justin put it, “the Stoics, at least in their teachings on ethics, demonstrated wisdom, thanks to the seed of the Word present in all peoples, and we know that those who followed their doctrines met with hatred and were killed”. Previous articleWherefore art thou, Modesty?